For your users to get the most out of your ERP and mobile computing devices, a reliable wireless network is a must-have. You traded in pen and paper for an ERP system. Then you invested in mobile barcode scanners to add even more automation and productivity gains. But, something’s still not right. The scanners seem to take forever to read labels and looking up information on the devices takes even longer. These are the kinds of problems we see when companies don’t take our recommendations with their hardware purchases. It’s like buying the latest 4K TV without purchasing a 4K HDMI cable and then saying that the picture isn’t that good. If you’ve selected the right hardware for your warehouse, but you’re still not getting the “4K” experience you expected, your barcode scanners might not be the problem — it could be your wireless local area network (WLAN). Disclaimer: We’re also not insisting you need to replace your existing WLAN equipment with our solution. We want to ensure that your ERP software, barcode scanners and printers are working at their full potential. We know from experience that your WLAN plays a vital role in your barcode scanning and business process automation success. Perhaps you’re just looking for help configuring and managing your network. We can connect a secure VLAN (virtual local area network) to your system and provide some of the same patch management, router configuration and security features we offer with our wireless products and services. Who is this VLAN service for? This wireless strategy is for customers who currently have wireless infrastructures as well as customers who don’t. Why do I need your VLAN service if I already have a wireless network? This investment is less than $5,000 and you get enterprise access points that are configured for Global Shop on-premise or cloud; plus, remote access for EMS & Global Shop to expedite, support and overnight replacement hardware for the life of the product. In almost all cases, our customers already have a network and wireless in their building. We use your current infrastructure and create a “private” network that will only allow the devices that are critical to keeping the shop floor / warehouse running at full speed. For a typical customer, this investment is less than $5,000 and you get enterprise access points that are configured for Global Shop on-premise or cloud; plus, remote access for EMS & Global Shop to expedite support, and overnight replacement hardware for the life of the product. Customers tell us that the best part of this is what doesn’t happen. It’s the support call that’s handled on the first call in just a few minutes compared to a lengthy investigation involving IT support, software support, and hardware support. To figure the ROI on this investment, consider how much it costs your company when your shop floor production stops. To give you an idea of some of the wireless networking-related issues we’ve helped other clients resolve, here are the top five that hamper user productivity and cause other problems. If you’ve ever tried making a cellphone call in a remote area, you’re familiar with the annoyance of a weak signal — difficulty hearing the other person, only catching parts of the conversation, dropped calls, etc. Users can experience similar problems with their WiFi connected devices in the warehouse if their device is too far away from an access point (AP) or something is blocking the signal. Not only does voice communication become frustrating, sending and receiving data slows to a halt, and it can seem as if the device isn’t operating correctly. The best way to eliminate dead spots is by performing a wireless site survey, which entails a combination of gathering information about the building square footage and identifying potential obstacles such as steel racks, concrete walls, neighboring WiFi networks, wireless security cameras, etc. The survey also includes an assessment to determine radio frequency (RF) behavior in a specific environment before selecting and implementing APs and wireless controllers. At EMS Barcode Solutions, we use tools from Cisco Meraki to perform a virtual site survey before making any recommendations, which gives us a very high success rate (95%-plus) for wireless AP deployments. Unlike other providers that charge $1,500 (minimum) for this service, we offer it for free because we know how important it is for our customers. In many instances, we’re able to provide our clients with superior wireless coverage using fewer APs than they would have selected if they skipped the survey and tried to guess how much equipment they needed. After the site survey, the next most likely cause of inadequate WiFi performance is due to dropped connections between access points. This problem is a tell-tale sign of a low-end wireless router, which isn’t designed for access point hopping in a large environment. Enterprise-grade gear like Meraki, on the other hand, is equipped with mesh technology, which creates an interconnected cloud among the access points and operates as a single network. When one node can no longer operate, the rest of the nodes can still communicate with one another, directly or through one or more intermediate nodes. This next problem requires a two-step solution. First, you need to determine how much bandwidth is available. And then you need to determine how much bandwidth is consumed when the network is under full utilization (e.g., multiple users are accessing the network simultaneously). If the two numbers are too close, it’s necessary to allocate additional bandwidth. However, that’s not always the solution. In some instances, non-work-related activities are the culprit. For example, if workers use their mobile devices to stream podcasts or YouTube videos, it can eat up a lot of bandwidth. The Meraki solution lets us whitelist specific IP addresses. So, if someone tried to go to Facebook, for instance, they couldn’t access it. EMS Barcode can configure your mobile computers to only allows users to connect to GS Mobile, which prevents users from going to the Google Play store and adding apps to the devices. Meraki APs also include QoS (quality of service) capabilities which enable us to give a higher priority (i.e., packet prioritization) to mission-critical voice and data services. Signals from unsecured WLANs that extend outside the corporate network can be found and used by unauthorized personnel — including malicious hackers. WLAN security measures are not very different from those required to build strong wired security, starting with password-protecting the network and requiring strong user passwords before granting access. APs come with a standard network name such as “default,” “administrator,” or “linksys” which broadcasts to WiFi-enabled devices the availability of the access point. You should change this setup immediately upon installation. When renaming the AP’s service set identifier (SSID), choose something that’s easy to guess like your company name. Except for your guest WiFi network, you should disable the broadcast to limit those who may be casually looking for an open wireless network. Another reason EMS Barcode Solutions recommends and sells Meraki wireless solutions is that they include robust security and other performance features that go beyond the consumer-grade APs found at big box retail stores. For example, Meraki’s cloud-based controller gives warehouse operators visibility over the entire WLAN, allowing them to monitor, troubleshoot and update devices anytime from an internet-connected device. And, if you’d prefer, EMS Barcode Solutions can perform the above tasks for you. Plus, with our VLAN service, we’ll set up and manage your APs and wireless network for you, including performing patch management on your wireless gear and mobile devices, ensuring optimal performance. One of the frustrations with buying IT equipment is that it becomes obsolete in a short period. Since Meraki is cloud-based and software driven, it extends the life of your hardware, allowing it to grow and scale with your business. For instance, you may initially want to use your network to tackle the basics — allowing users to connect and access Global Shop ERP software while away from their workstations. In time, however, you might want to consider turning on more advanced features such as asset / inventory tracking. Using Bluetooth, the Meraki system even can perform intelligent work in progress (WIP) functions and alert a user to the whereabouts of a pallet. Down the road, you may want to add IP video surveillance cameras in your warehouse, and you’ll want to connect these Internet of Things (IoT) devices to the internet. Meraki’s novel architecture places video storage on the camera, not the cloud, ensuring mission-critical network activities get the bandwidth they need. We’re not looking to replace your IT staff or third-party IT solution provider. The day-to-day IT tasks your IT team or managed services provider (e.g., employee password resets or workstation freeze-ups) handles will continue being their responsibility. We want to ensure your wireless network and mobile devices continue working at their full potential. 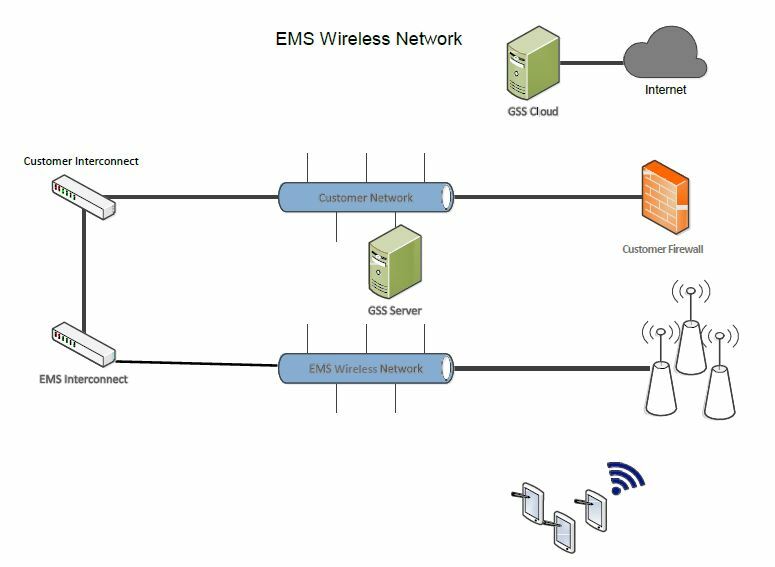 Contact an EMS Barcode Solutions wireless expert via our website to learn more about how we can help optimize your WLAN. We’re available via web chat, email or phone, and our friendly and knowledgeable staff is ready to assist you. We’re not looking to replace your IT staff or a third-party IT solution provider. We want to ensure your wireless network and mobile devices continue working at their full potential — if you need our assistance. 802.11 ac — The IEEE’s’ (Institute of Electrical and Electronic Engineers’) latest wireless networking standard in the 802.11 family (which is marketed under the brand name Wi-Fi). It was designed to improve wireless services in the enterprise and has the potential to be faster than Gigabit Ethernet. Full utilization — In networking, utilization is a percentage defined as the amount of traffic traversing it divided by the link capacity. Full utilization occurs when this number approaches 100%. QoS (quality of service) — Data traffic monitoring technology which allocates packet prioritization and manages network traffic to reduce packet loss, latency and jitter on the network. SSID (service set identifier) — A sequence of characters that uniquely names a wireless local area network (WLAN). An SSID is sometimes referred to as a “network name.” This name allows users to connect to the desired network when multiple independent networks operate in the same physical area. VLAN (virtual local area network) — A VLAN is a group of devices on one or more LANs that are configured to communicate as if they were attached to the same wire, when in fact they are located on many different LAN segments. Because VLANs are based on logical instead of physical connections, they are incredibly flexible. Wireless site survey — The process of planning and designing a wireless local area network (WLAN), which includes providing a wireless solution that delivers the required wireless coverage, data throughput, network capacity, roaming capability and quality of service (QoS). WLAN (wireless local area network) — A wireless distribution method for two or more devices that use high-frequency radio waves and often include an access point (AP) to the internet. 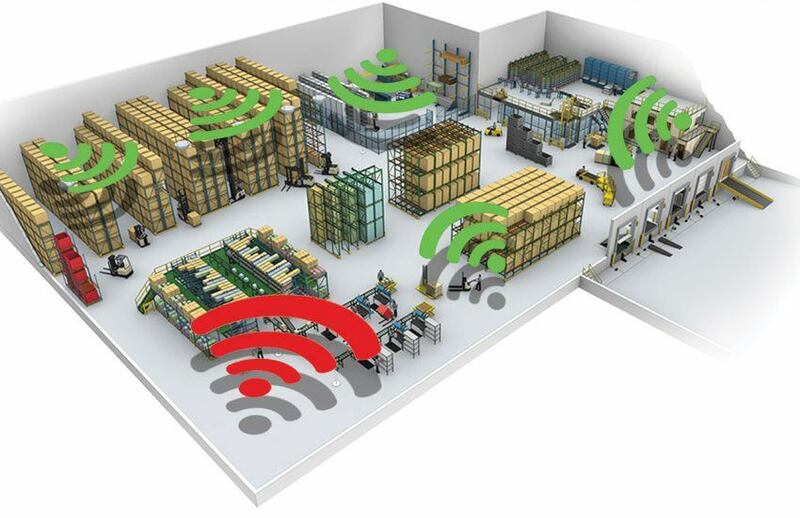 A WLAN allows users to move around the warehouse while maintaining a network connection.